Summer is ending with some very dry weather – we haven’t had any rain in weeks. 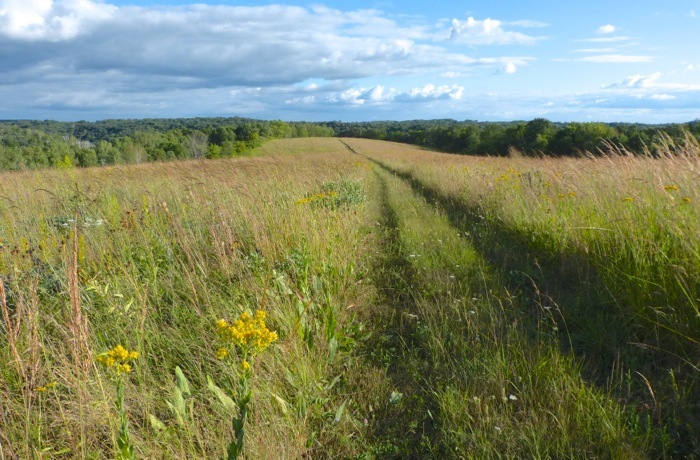 The prairies survive when it doesn’t rain, but they’re beginning to look a little wilted. But the flowers are still blooming, and the birds and insects are working on their preparations for winter. Bluebirds, Barn Swallows, Orioles, and Rose-breasted Grosbeaks have mostly gone. The hummingbirds are still here – so many of them that they’re going through 3 full feeders of sugar water every few days. I think they’re migrants, because they don’t seem to know exactly where the feeders are, and they come up close to the windows and the screens to peer inside the house. 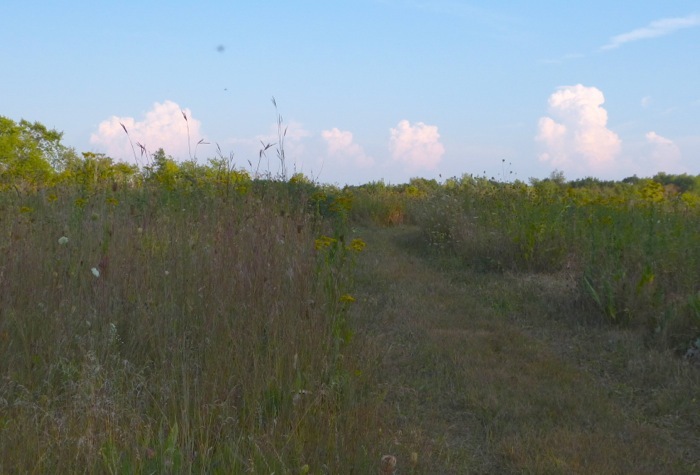 Our friend Matt visited a few days ago – a quick overnight stay but we took him on a long walk – the “all prairie walk” from the Knife Edge all the way to Big View Prairie. 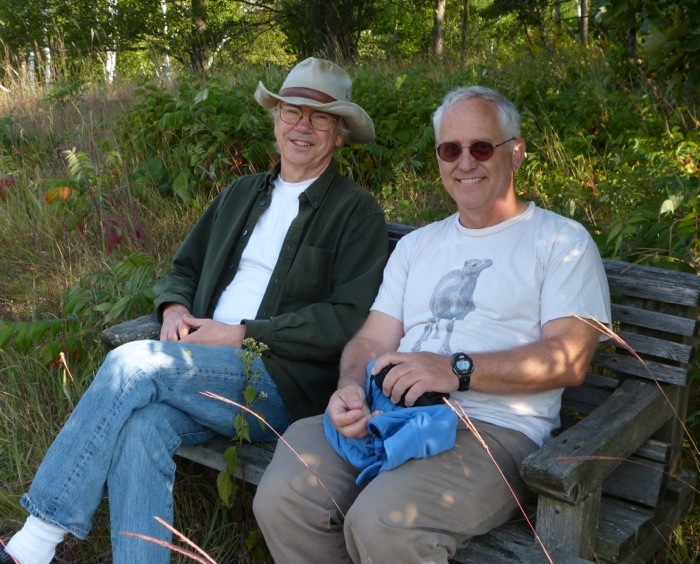 Here are Mike and Matt on the Hidden Oaks Prairie bench. We’re seeing more Monarchs now, at the end of the summer. I hope that means that they’ve had a reasonably good breeding season. 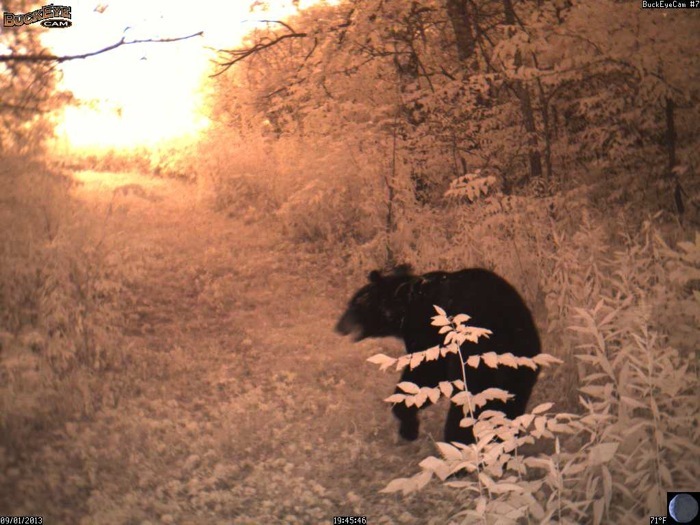 (Their population last winter was the lowest it’s been since people have been counting.) 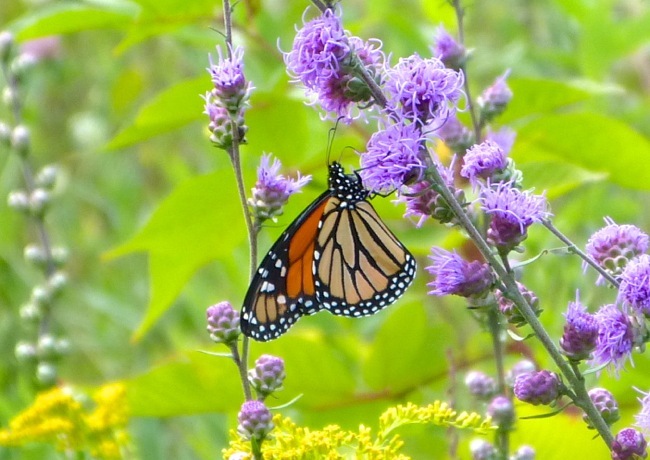 We have a couple of large areas of Rough Blazing Star, which is one of their favorite nectar plants during migration, and we see Monarchs there nearly every time we walk by. I’ve been seeing big flocks of mixed warblers and chickadees in the trees. 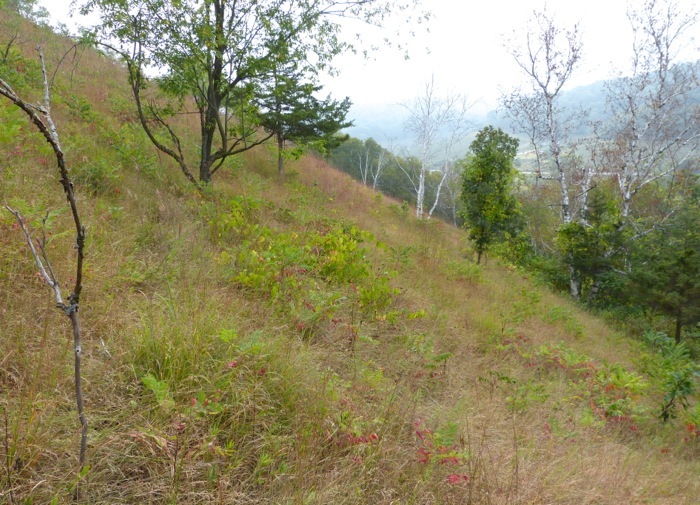 A few days ago I was on Sumac Prairie, and there were Chickadees and American Redstarts fluttering around in the Red Cedars on the hillside. 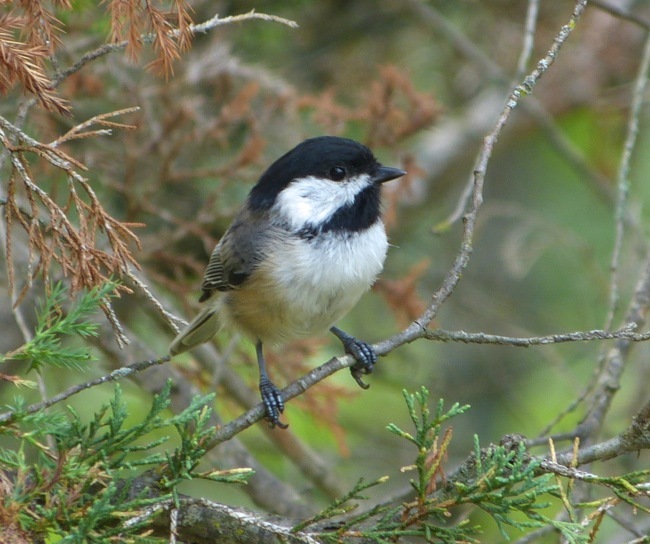 Here’s one of the friendly Chickadees. 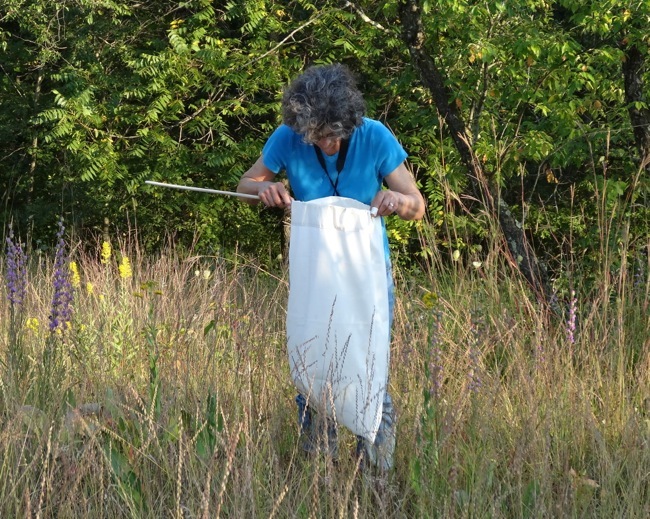 I’ve been spending some time using a sweep net – something I’ve never done before – searching for a rare hopper on some of our remnant dry prairies. 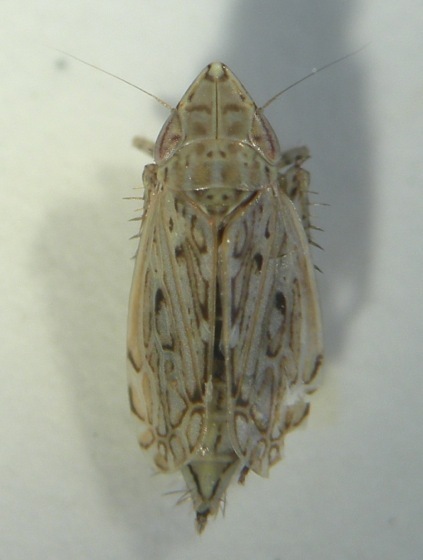 My friend MJ is looking for more locations for this insect, and she thought we might have some somewhere on our place. Here I am, peering into my very homemade sweep net. I sweep the net back and forth, through the vegetation, near the ground, and then look inside to see what I’ve got. So far I haven’t found the rare hopper, but I’ve found several other interesting hoppers, including these two. 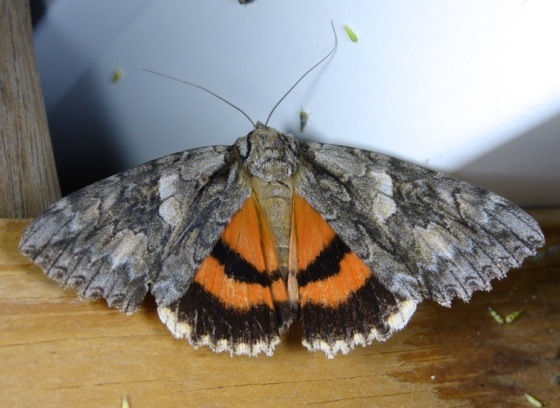 This one has wonderful designs on its wings – I’m hoping to find out what kind it is, but I don’t know yet. 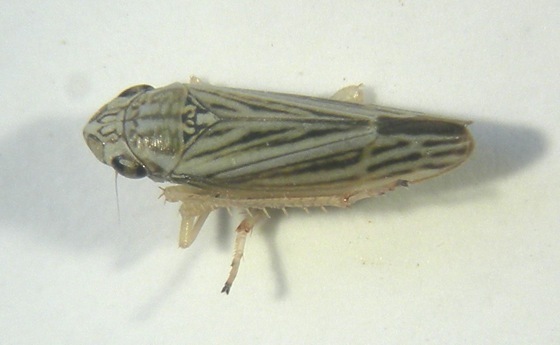 I’ve posted it on Bugguide, and hope the hopper expert can help figure it out. A Walking Stick came to my lights one night. I’m not sure if it was really attracted to the lights, or just happened to be walking by – I’ve never seen one at lights before. 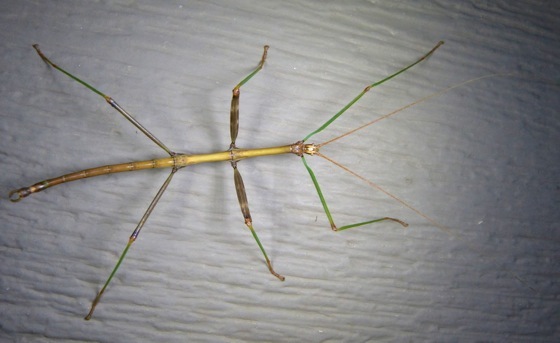 It’s the most common species in our area – a Northern Walking Stick. Here are two interesting milkweed dependent species. 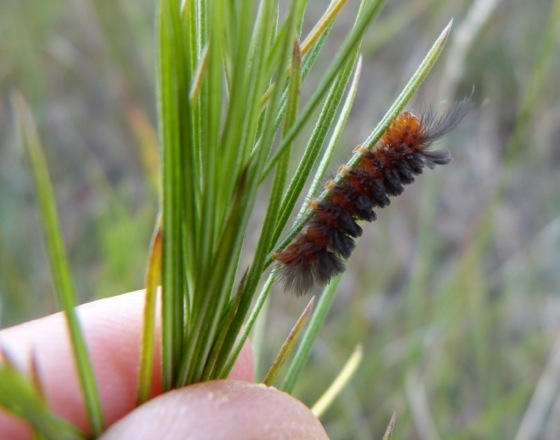 There are many other caterpillars – besides Monarchs – that also eat milkweed. 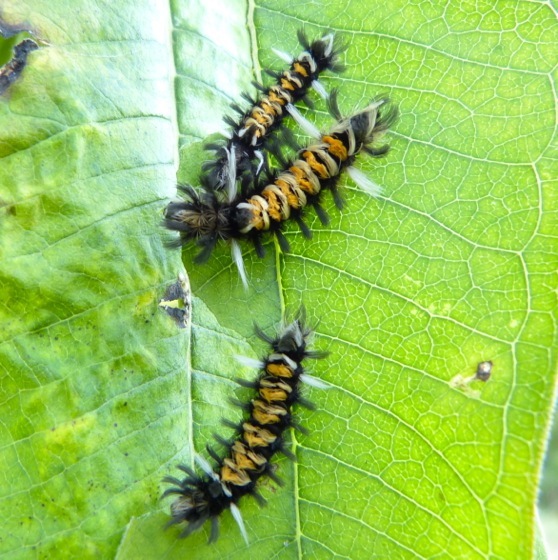 These are Milkweed Tussock moth caterpillars. They feed in groups, and tend to eat older leaves, while the monarch caterpillars prefer newer leaves. 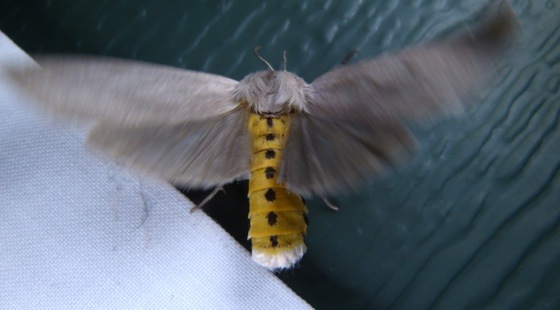 This is an adult Milkweed Tussock Moth – it has plain gray wings, and a bright yellow and black body. This one came to my lights in June 2012. This is the caterpillar of a very uncommon milkweed moth – an Unexpected Cycnia. I find them on Whorled Milkweed in our dry prairie remnants, but they will eat several other species of milkweed. Here’s an adult Unexpected Cycnia on Sumac Prairie in May 2012. We had a great bear adventure last week. 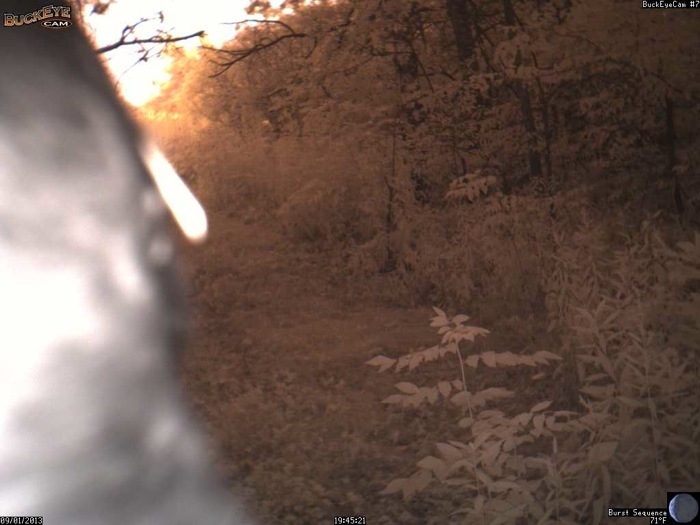 We were putting a new battery in one of our wildlife cameras – the one at the top of the Dugway Trail. We put the battery in, closed the camera and started down the trail. 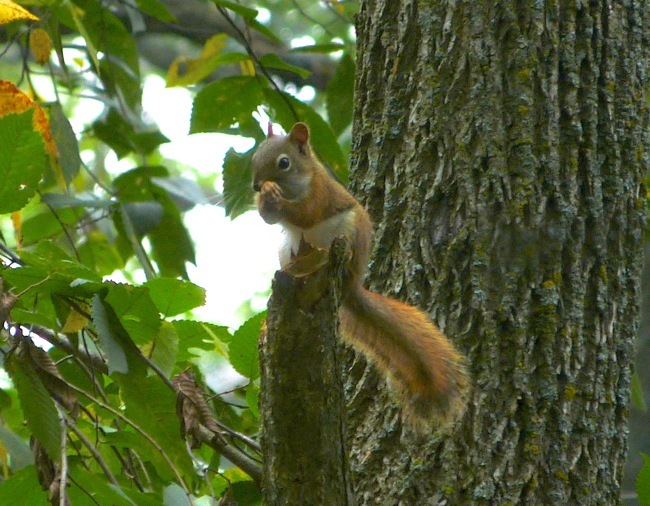 Here are the photos from the camera. The first one is my shoulder, as I’m closing the front of the camera case. Notice the time stamps on that and the next two photos. 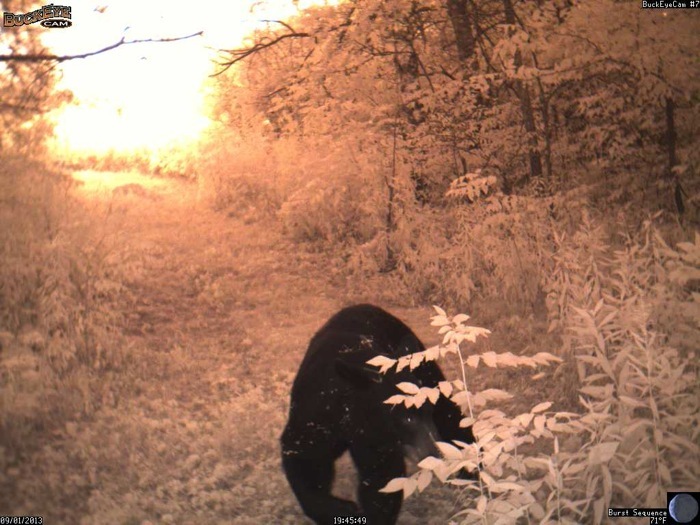 24 seconds after we turned away from the camera, the bear walked out of the woods. It’s probably a good thing we didn’t turn around to look behind us. 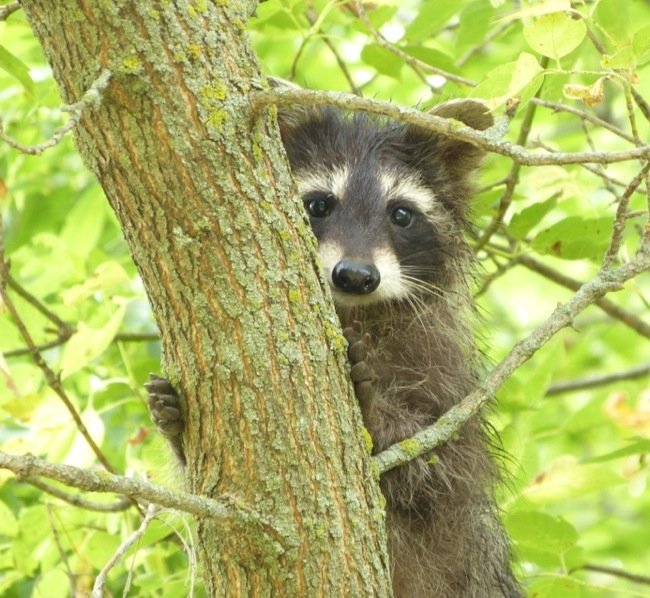 and one of a couple of baby raccoons that I encountered on the driveway one day. They scurried across the driveway and up into one of the trees, but they sat there watching me for a long time from a safe perch. The wetland doesn’t seem to be having any problems from the drought. 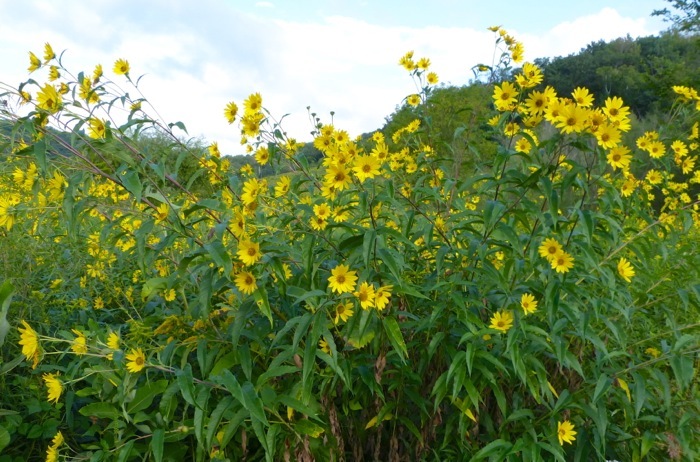 Tall Sunflowers are blooming now – very tall and lush. Thunderclouds over the Cat’s Paw Prairie – unfortunately they were heading east, away from the farm. 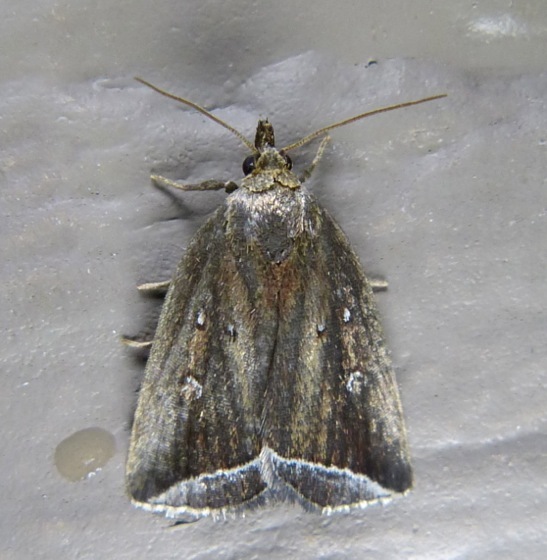 Here are a few favorites from the last few weeks of mothing. 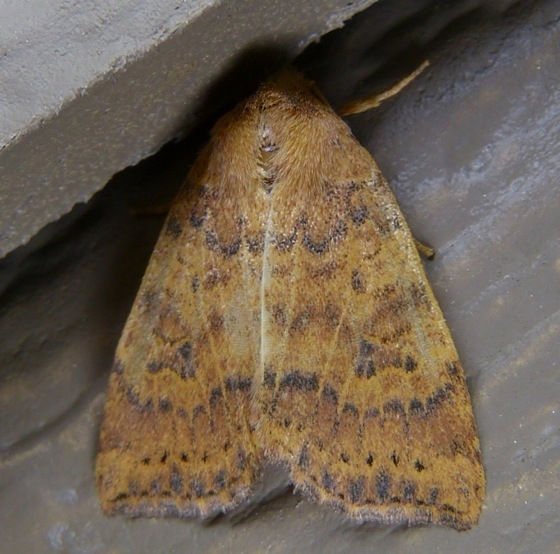 To see more, click here to see my September moths – so far. 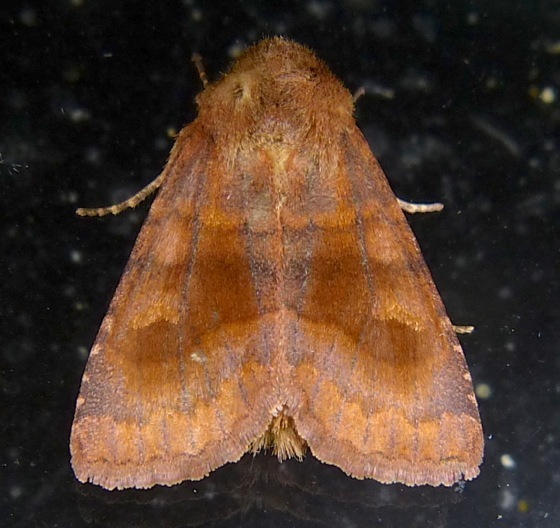 Bronzed Cutworm – a very common moth that can be a pest on corn and cereal grasses. They’re very common at my lights right now. 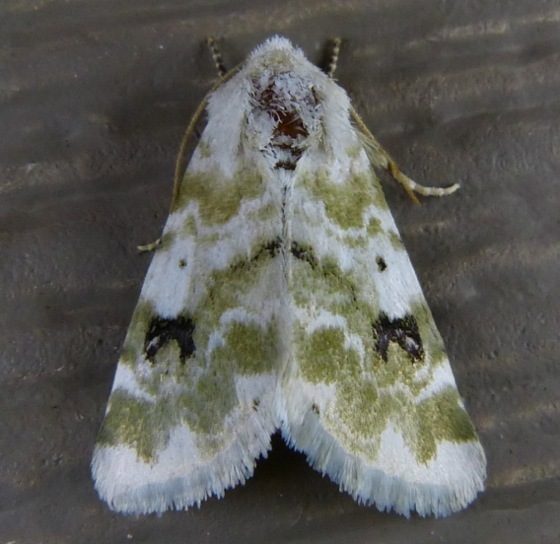 Most are much darker and less showy – this is the prettiest one I’ve seen. 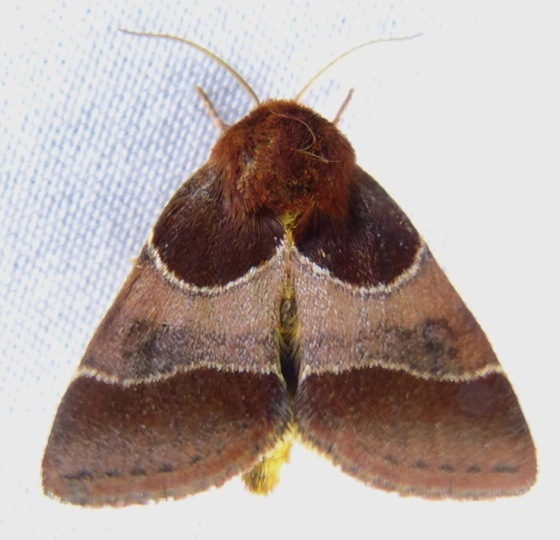 Orbed Narrow-wing – This moth is normally found in the far southern U.S. and Central America. At the end of the summer some individuals fly north, sometimes as far as Canada. 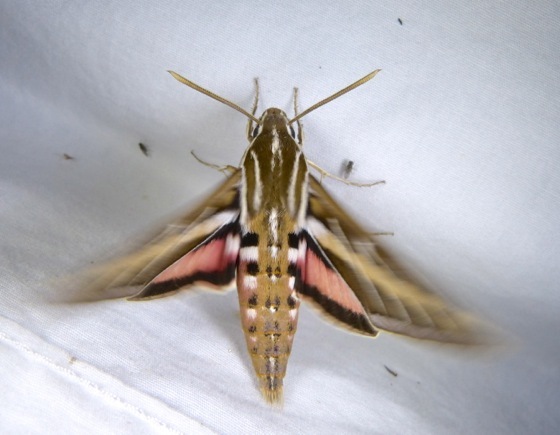 White-lined Sphinx – these are very common this year. Keep your eyes open – you can often see them hovering at flowers at dusk. 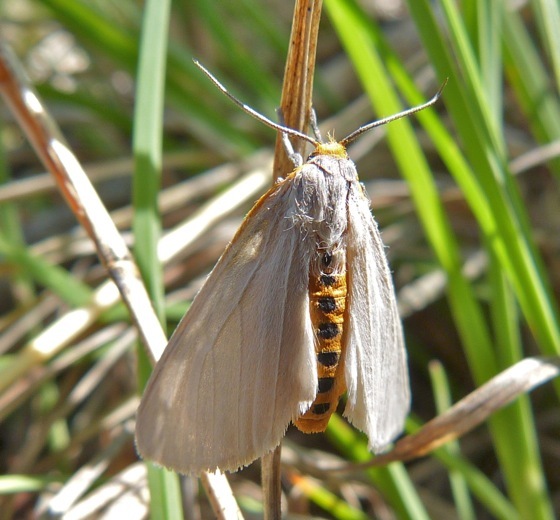 Here are two Flower Moths – their caterpillars eat flowers of various plants. 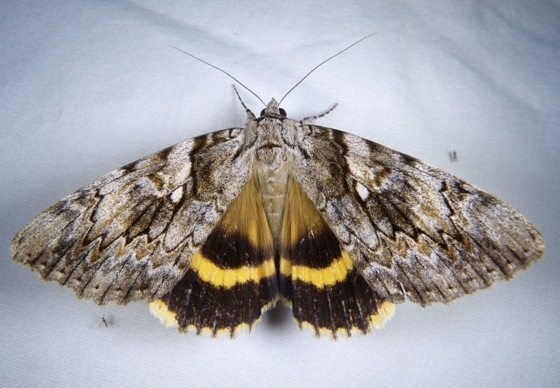 This is an Arcigera Flower Moth – their caterpillars eat asters. 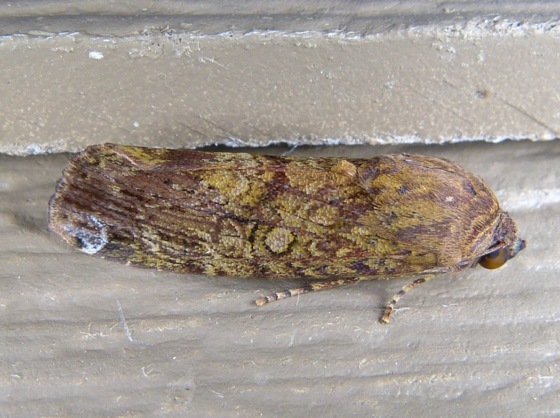 And a Goldenrod Flower moth.